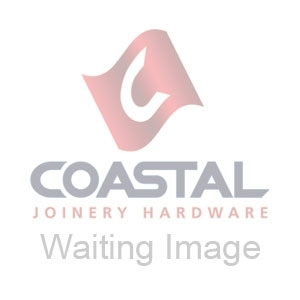 Coastal offer an elite selection of handles for use with window espagnolette systems, in both locking and non-locking versions in many finishes, please note that these handles are not designed to work with any tilt & turn systems, tilt & turn window handles need to be made stronger to cope with the additional forces. The EH10 locking window handle ergonomically designed for comfort, for use with espagnolette locks with an 7 x 40mm spindle. Cranked to suit left and right hand windows. Has a positive stop to ensure an accurate inline closure. Locking version has a key dead lock for added security. Push to unlock mechanism. 10 Year guarantee. Please Note: The handle is supplied with 2 blanker caps, one green (to show fire escape) and one black (just used as a blanker), these are used for when the handle does NOT require locking, the caps are pushed into the key hole to blank off. Screws are NOT included - order code FX1040. Spare screw cover cap - order code FX6060. Spare locking key - order code FX6070. Available in Polished Brass, Polished Chrome, Satin Chrome, Black, and White finishes. A very stylish ergonomically curved window espagnolette handle from the elite Kuhlen™ suite. Features a key lock and an 7 x 35mm spindle. Available in Polished Brass, Polished Chrome, Black, Satin Chrome, or the range exclusive Smokey Chrome finishes in both left and right cranked versions. Fixing - Select - The SST81 left hand and right hand handles are fixed to the sash using fixing bolts which are supplied. The SST81 can also be converted into a non-locking window espag handle - download the info document under the 'Drawings' tab below for more information. Fixing - Select - The SST85 casement window handle is available in either Left Hand or Right Hand and is fixed using 2 fixing bolts. blu™ Satin Stainless Steel Window Espagnolette Handle. This sleek, contemporary lockable design features the added benefit of a cranked handle to avoid the handle stub clashing on the frame. Ideal for the most corrosive environments, including locations within 5 miles of the coast. Fitted with 7 x 40mm spindles for most applications. Handed for both left and right hand windows. blu™ Satin Stainless Steel Window Espagnolette Handle. This sleek, contemporary lockable design features the added benefit of a cranked handle to avoid the handle stub clashing on the frame and also has a sprung action to keep the lever in place. Ideal for the most corrosive environments, including locations within 5 miles of the coast. Fitted with 7mm spindles in various lengths and suited for most applications. Handed for both left and right hand windows. 7mm Spindles in various lengths. A slimline, contemporary design inline window espagnolette handle which features the added benefit of offset stem technology to avoid the handle stub clashing on the frame. Fixing - Select - The REG020 has a screw fix which fixes into the sash using the fixing bolts provided. A high quality elegant and traditional design lever handle produced from solid marine 316 stainless steel. Superbly suited with the REG090 door handle this product is perfectly suited for a high specification timber window. If your looking for a handle to stand up to severe harsh weather look no further! A high quality elegant and traditional design lever handle produced from solid marine 316 stainless steel. Superbly suited with the TBH090 door handle this product is perfectly suited for a high specification timber window. If your looking for a handle to stand up to severe harsh weather look no further! Premium quality antique selection of Curly (or 'Monkey') Tail Window Espagnolette Handles designed for timber windows, perfectly embracing the traditional aesthetics with modern security performance. Available in 25mm backplate with a standard 7x7mm spindle and 43mm fixing centres. Available as a locking handle in Dull Black, Antique Pewter. Premium quality antique selection of Bulb End Window Espagnolette Fasteners designed for timber windows, perfectly embracing the traditional aesthetics with modern security performance. Available as a locking handle in Dull Black, Pewter, and Light Oil Rubbed Bronze finishes. Part of the Realm­™ family, the Villand Lever Handle is traditionally hand made and suitable for multipoint espagnolette window locking systems. Based on a timeless barley twist design that has been used for centuries, this stunning range is widely used in period properties.